TORONTO, ONTARIO--(Marketwire - Feb. 19, 2013) - Touchstone Gold Limited ("Touchstone Gold" or the "Company")(TSX:TCH)(AIM:TGL) is pleased to announce the commencement of the Stage 4 Drilling Program, as scheduled, and the identification of a new drill-ready target zone at its Segovia Gold Project in the Department of Antioquia, Colombia. Touchstone President and CEO, David Wiley, commented, "We are excited to begin our Stage 4 Drilling Program, building on our previous drilling success. We will be stepping out along strike and down dip from the known gold mineralization at the 1141 zone and also testing two other prospective zones, presenting opportunities for new discoveries. We expect to turn assays around quickly and look forward to reporting the first results in April, which we are hopeful will confirm the high potential of our assets in the region." Two drilling rigs have been mobilized to the Segovia Gold Project (the "Project") to carry out the Stage 4 Drilling Program, as scheduled. The initial 5,000-metres of the Program will be conducted in three target zones ― Tagual, 1141 and Bern, located in the Rio Pescado property of the Company's Segovia Gold Project (Figure 1). High-grade intercepts from the 1141 zone confirms the continuity of mineralization along trend on the Rio Pescado property. 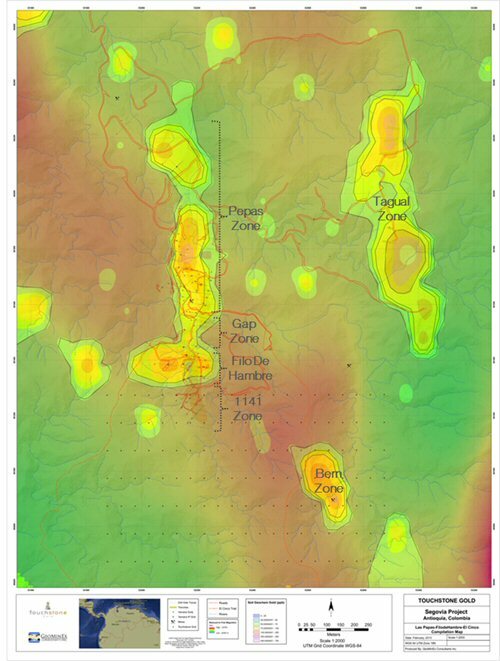 The Tagual Zone, located approximately 600 metres east of the Pepas zone, was discovered in September 2011 (See Company news release dated September 15, 2011). Tagual has an approximately 1,000 metres by 400 metres gold (Au) geochemical signature and hosts gold-bearing quartz vein material. During the Stage 3 exploration Program, a series of trenches were put in along strike to test for the potential source of the gold soil geochemical anomaly. Highlights from trench sampling in Tagual are outlined in Table 1 below. The Bern Zone is located approximately 500 metres southeast of the most recent drilling in the Filodehambre Zone at the Rio Pescado property. The Bern Zone is characterized by a gold-tellurium ("Au/Te") geochemical anomaly measuring approximately 400 metres in strike length by 150 metres in width. The geochemical anomaly is underlain by an IP chargeability anomaly with a corresponding resistivity high. This coincidental Au/Te anomaly is similar to many of the areas of gold mineralization in the Pepas-Filodehambre areas of the project. Recently obtained geophysical data suggests that the IP chargeability anomaly continues to the south onto the El Cinco Property. Touchstone Gold plans to aggressively pursue this recently identified area of interest in the upcoming drilling Program. To view "Figure 1 - Plan view of target zones in the Rio Pescado Property", please visit the following link: http://media3.marketwire.com/docs/TCHfig1.jpg. Gold mineralization at Rio Pescado is hosted in 1 to 30-metre wide massive, generally fractured, lenticular zones of milky quartz with gold associated with sulphide mineralization consisting of mainly pyrite with lesser chalcopyrite, sphalerite, galena and rare arsenopyrite. Structurally complex vein mineralization is associated with a NNW-SSE main shear zone and NW-SE secondary shear zone with gold associated with nearly horizontal lenticular veins and nearly vertical veins. John Nicholson, Chief Geologist of Touchstone Gold Limited, is a qualified person as defined by National Instrument 43-101 and prepared or reviewed the preparation of the scientific and technical information in this news release with respect to the assay results from the drilling Program. Mr. Nicholson has a B.Sc. from the University of British Columbia, is a Fellow of the Royal Geographical Society and has been an accredited member of the Association of Professional Engineers and Geoscientists since 1992. Mr. Nicholson has verified the data disclosed in this release, including the sampling, analytical and test data underlying the information presented. Verification included a review and validation of the applicable assay databases and reviews of assay certificates. The core samples were split by diamond saw, and half of the core was sampled. Core samples were prepared by Acme Analytical Laboratories ("ACME") in Medellín and were assayed at ACME in Vancouver, British Columbia. All samples then undergo analyses by method 1Dx2 where a 15 g split is leached in hot Aqua Regia and then analyzed by ICP-MS for 36 elements including Au. The larger 15 g split of the samples was chosen in order to give a more representative analysis of elements subject to nugget effect (e.g. Au). Method G601, 30 g lead collection fire assay, was performed on analyzed drill core samples with greater than 5 g/t Au from the ICP analyses. An automatic over limit analysis (G6Gr), 30 g lead collection fire assay with gravimetric finish, was performed on assayed drill core with greater than 10 g/t Au from the 30 g fire assay. Blank, standard and duplicate samples were routinely inserted for quality assurance and quality control. Touchstone Gold Limited (TSX:TCH)(AIM:TGL) is a gold exploration company and its primary assets, which collectively comprise its Segovia Gold Project, are the Rio Pescado, San Miguel, and Frontino Norte properties along the Segovia-Remedios Gold Belt in Colombia. Rio Pescado is comprised of four mining concessions, the San Miguel property is comprised of one mining concession and one proposed mining concession, and the Frontino Norte property is comprised of four mining concessions and one proposed mining concession. Touchstone owns further options on the Santa Rosa Project, in the South Bolivar area of Colombia, comprised of four proposed mining concessions and one mining concession. With a philosophy of creating value by the systematic exploration and development of Touchstone's existing assets as well as the acquisition of suitable exploration and development mineral projects, Touchstone's long-term intention is to build a significant gold exploration and production company. For additional technical information on the Rio Pescado Deposit, please refer to the Company's technical report (the "Technical Report") entitled "Technical Report on The Rio Pescado Gold Property, Republic of Colombia" dated June 30, 2012, prepared by Peter A. Christopher PhD., P.Eng. of PAC Geological Consulting available on SEDAR at www.sedar.com and on the Company website at www.touchstonegold.com. Certain information set forth in this press release contains "forward-looking information" under applicable securities laws. Except for statements of historical fact, certain information contained herein constitutes forward-looking information which includes the completion of the Acquisition, the drill Program and management's assessment of Touchstone's future plans and operations and are based on Touchstone's current internal expectations, estimates, projections, assumptions and beliefs, which may prove to be incorrect. Some of the forward-looking information may be identified by words such as "expects" "anticipates", "believes", "projects", "plans", and similar expressions. These statements are not guarantees of future performance and undue reliance should not be placed on them. Such forward-looking information may necessarily involve known and unknown risks and uncertainties, which may cause Touchstone's actual performance and financial results in future periods to differ materially from any projections of future performance or results expressed or implied by such forward-looking information. These risks and uncertainties include, but are not limited to: liabilities inherent in mine development and production; geological, mining and processing technical problems; Touchstone's inability to obtain required mine licenses, mine permits and regulatory approvals required in connection with mining and mineral processing operations; competition for, among other things, capital, acquisitions of resources and reserves, undeveloped lands and skilled personnel; incorrect assessments of the value of acquisitions; changes in commodity prices and exchange rates; currency and interest rate fluctuations; various events which could disrupt exploration and development, including labour stoppages and severe weather conditions; and management's ability to anticipate and manage the foregoing factors and risks. There can be no assurance that forward-looking information will prove to be accurate, as actual results and future events could differ materially from those anticipated in such statements. Touchstone undertakes no obligation to update forward-looking information if circumstances or management's estimates or opinions should change except as required by applicable securities laws. The reader is cautioned not to place undue reliance on forward-looking information.